At Noggin we’ve enjoyed it over the years too (even though we’re not strictly speaking in that demographic group). But that said, we’ve noticed a new trend emerging of late. Now that everyone’s been working on their ‘Why?’ for a few years – their purpose and their values – it’s kind of a done deal. These days, people arrive at our workshops fully why’d up. They know full well why they are there, why they are in business, and why they got out of bed that morning. This goes especially for millenials, 70% of whom favour purpose over profit, when looking for a career. Hell, these guys are even called ‘Generation Y’. What they are less clear on though, is who it is that knows all this. It’s making everything more juicy and exciting. 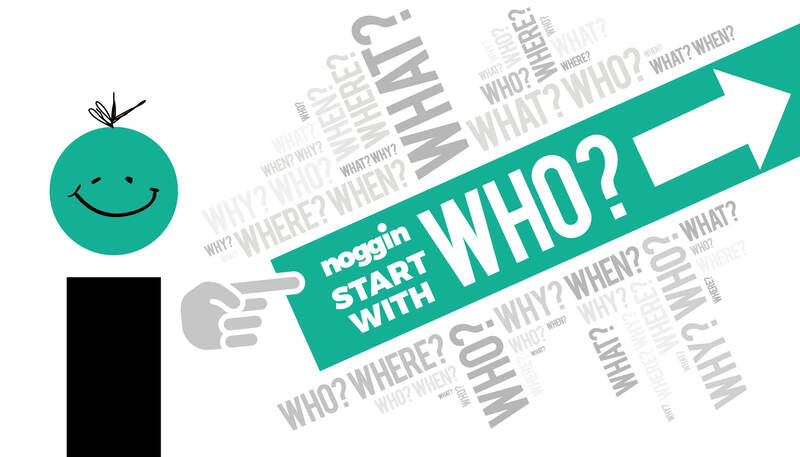 A while ago our dear leader Ben (who you may know from this blog), bought out the other Noggin partners, and created Noggin 2.0. Embarking on this mission with passion and purpose, a white-knuckle ride ensued. The team honed its skills… legendary pieces of work played out in large blue-chip organisations… and Noggin’s loyal tribe of left-brainers grew and grew. It came to pass that we not only survived our breakneck transition into Noggin 2.0, but thrived. We’d become something new, and it was working. We’d changed, and kept the best things the same. We’d upped our X-Factor… and we needed a break. In other words, we took a long look in the mirror… and everything changed. In asking the ‘Who?’ question, we began to see that our identity is as important as our intrinsic motivations. Who is living this unchangeable why? How do we share our why on an ongoing basis, in ways that feel fresh and real, as the world now demands of us? How do we acquire the skills needed to shape our values each day into something that fits the world? How do we ensure that bespoke solutions – pieces of work that are different every time they are delivered – continue to channel our ethos and intentions, consistently and congruently, over time? In traditional stories and folklore, shape-shifting is the shamanic skill you need to survive in the jungle. It is the ability to adapt to your surroundings and blend in – to different environments, groups and situations. It’s the skill you need to change your behaviour, your persona and your point of view, so you can participate fully and be of service to the situations you find yourself in. Our existential discovery at the Noggin away-day, and that of our clients in the latest Noggin workshops, is that while the why stays the same, the who is ever changing. By proxy, the less changeable we are, let’s call it flex, the less we can adapt to multiple situations and contexts. And the more flex we have, the more we can face our in-built resistance to unfamiliar territory, fear, discomfort and vulnerability. So much so, over time we can become immune to the very notion of it. Overcoming our immunity to change is the ultimate life skill, not our why or our values. And this is what we do at Noggin – we help people overcome their immunity to change. So they can embrace change, rather than resist it. Because who we really are is an ever-evolving response to what is happening around us right now. If we can’t overcome our immunity to this process, in which variation is the only constant, we either end up a rigid expression of our why – unable to find a home in the changeable field of society – or a value-less, purpose-free identity, grasping at any chance life gives us. At Noggin we support our clients in navigating the jungle, and shifting into whatever shape is needed, on any particular day. We don’t prepare people for everything, we prepare them for anything.